Diego and friends at Olvera Street, downtown Los Angeles December 23, 2011. Like Neptune, Poseidon or The Submariner, Diego has always had a great, natural attraction to water. He was obviously a fish in a past life. But with personal safety always a concern for the parents of any child, and particularly children with autism, who can often be fearless to the point of unwarranted risk-taking, a trip to the beach can be an adventure in the fine line between fear and love and the attraction that the ocean waves exert. On our recent outing to the beach, Diego was simultaneously very conscious and concerned about the danger present, and incredibly drawn to fling himself headfirst into the surf. This was the result! Today's post is a confluence of many of the various interests and influences that shape my life and crop up here from time to time: Chicago, autism, the writer Nelson Algren, my family, life lessons, and most of all, Diego's inspired sense of humor. "Never play cards with a man called Doc. Never eat at a place called Mom's. Never sleep with a woman whose troubles are worse than your own." "Never think you know how to play connect the dots until you've played with a child on the autism spectrum!" As you can see by the photo, Diego took the idea of "thinking outside the box" quite literally, as he pushed the boundaries of this venerable game in new directions. In an interview once Algren noted, "The book asks why lost people sometimes develop into greater human beings than those who have never been lost in their whole lives." Playing connect the dots with Diego was my own "walk on the wild side". It was only a matter of time before Natalie's blossoming t-ball career caught Diego's interest. So I got him a baseball mitt and took him in the backyard to see how he responded to engaging in scooping up some grounders and playing a game of catch with his sister. Not surprisingly, he very quickly invented his own version of the venerable game that Abner Doubleday supposedly laid down the rules for in Cooperstown in 1839 (like most received wisdom this commonly held truth has been pretty thoroughly debunked but persists nonetheless). Diego liked the mitt and the ball, but he wasn't that interested in putting them to traditional usage. As far as I know, spinning hasn't been considered an essential part of the sport until now, but Diego's first move, which I have dubbed here The Roman Candle, was to place the ball in the mitt and hold his arms out in a cross and spin faster and faster until the ball rocketed out of the mitt in whatever direction it was pointed when the centrifugal force took over, shooting out like a roman candle firecracker, most often into the bushes where Natalie and I went to retrieve it. The second spinning move he discovered was a bit more tried and true - holding the ball in his free hand and whipping his arm around in windmill fashion until once again the ball popped free in whatever random direction his arm was pointing when he let go. It was unpredictable to say the least, like a Hoyt Wilhelm knuckleball back in the days! When it came to ground balls, I encouraged him to hold his mitt close to the ground and scoop them up in the open mouth of his glove - like an alligator. Quickly tiring of my tried and true instruction, he found some wildly imaginative poses to strike that involved twisting the mitt backwards while snaking his arm around and through and behind his legs and body like a contortionist from the Cirque du Soleil. He didn't manage to collect many balls this way, but that was hardly the point. By far his favorite part of the sport was one of the most conventional and familiar to any fans of perennial last place teams like the 1962 Mets or the 1899 Cleveland Spiders (at only 20 wins holders of the worst season record in baseball history) - the old "throw it where they're not" trick. I'm looking forward to taking the kids to the park for another practice session. It's time for baseball to reinvent itself for the new generation, and I have a feeling that Diego's innovative and unorthodox style might just catch on!! 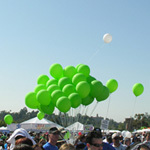 My Dad asked me to jump on the blog today and thank everyone who supported our Team - Diego's Friends - at the 2011 Walk Now For Autism at the Rose Bowl this past weekend, and to share a few words about my own thoughts and experiences of the day with all of you. Don't let this picture fool you. I'm not hiding behind that red balloon because I'm shy or anything. I just wanted to see what the world looked like all in RED. Pretty interesting. They say kids with Autism tend to see the world differently. I wonder if this is what they mean? Large crowds and loud noises can sometimes be overwhelming to kids like me who are on the spectrum and have a hard time with SENSORY INPUT and SELF REGULATION and other ways in which the brain organizes and makes sense of the environment around me; but I've been coming to the Rose Bowl for 4 straight years now, and each year it seems I get more chill; at least that's what I hear my Mom and Dad proudly tell the other adults. Me, I was feeling pretty excited. We made our own handmade t-shirts this year for our Team, and it was pretty cool to see how many families find creative ways to show their colors and express their love! Mom's good friend Maiz came out to walk with us with her son, and Dad wanted us all to pose for a Team Picture. But as you can see, I was much too busy taking care of business trying to wrestle away Maiz's son's super-cool blaster-shaped balloon to stand still for any posed group photograph! The Rose Bowl parking lot was full of vendor stands with all kinds of activities for us kids. I don't know what that kid is doing in that u-shaped thing, but it looks pretty fun. Last year I just didn't feel comfortable enough to let someone paint my face. But I'm turning six in a few months, and I've been thinking about my future. Being Spiderman might actually be something I could get used to. Hmmm. I thought everyone knew how to draw Spiderman, but it looks like next year I might have to bring the nice lady a comic book so she can have some reference to draw upon. Running in to some old friends from pre-school made me realize just how far we've all come in a short period of time. I guess I really should take a moment here to give props to all the great teachers and aides and therapists who have worked so hard to help me and my friends overcome some of our unique challenges. Or maybe I'd rather take off running to go see the Yo Gabba Gabba-looking dude with all the gym equipment. Climbing up was fairly easy. But now what? Thanks for the help, Gabba-man. Alright, maybe I do need to get to the gym more often. But with all the cutbacks in school budgets these days, I'm just not getting the OT hours that I used to! My sister has been going to ballet class, and it is obviously paying off as you can see in this wonderfully poised shot of her on the balance beam. I'm so proud of her. She's the best. My hats off to whoever invented these little individual rest stops for children with special needs. The small space and ball-filled seating area were just the right space for my over-taxed sensory system to take refuge and chillax. Sorry, Dad, that it was so hard to get me out of there, but do you think we could get one of those for home? Speaking of special, it was pretty special that our friends Ellen and Henry showed up at the end of the walk to hang out with us. Henry is just about to graduate from sixth grade and you'd think he'd have a lot of other things on his mind and places to go on a Saturday rather than to come and hang out with a kindergartener and patiently listen to me recite the ad copy and theme song from the latest Chips Ahoy commercials I watch on YouTube. But there he was - and wearing a Chicago Bulls Joakim Noah t-shirt no doubt. Now that's what I call a good friend, and one that epitomizes the spirit of everyone who came together and supported our team -Diego's Friends! P.S. Dad said our team raised almost $17,000 for autism research this year! And that the Walk altogether raised over $1.3 Million Dollars for Autism Speaks, the sponsor organization. Pretty cool, but with all that cabbage floating around I still can't understand why Dad said we couldn't afford that new Lego Adventure set I want! What's up with that? I've got Special Needs, I told him!